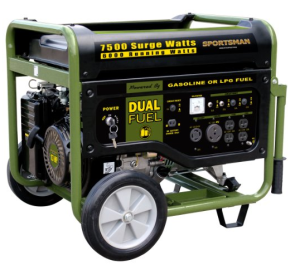 Dual fuel generators allow you to operate with different types of fuel including propane and gas. This allows the consumer to choose which one they prefer to use at the time. If you know you need to power up the entire house then you may decide on using fresh gasoline as it will provide easy power and for tools or going camping, or when your gas is old you can use the propane fuel. It is nice to have a choice on which type of fuel to use as it can save you money and hassle in the long run. Here are some of the best duel fuel generators to consider when trying to make a decision. 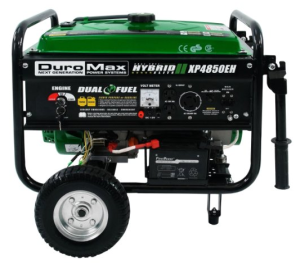 This Duro Max Dual Fuel Propane Gas Powered XP4400EH Portable Electric Start Generator allows you to use propane and gasoline as fuel. You can hook up any size propane tank that you choose and there is an easy assembly. There is a full power panel and a switch to shut off the engine when needed.It has two wheels and a handle for easy maneuvering and there is a volt meter and a circuit breaker to prevent overloading. There are a few outlets including one 120/240 volt twist lock of 30 amps and 120 volt 20 amp outlet. It weighs about 128 pounds and it has a low oil shut off to help prevent damage to the engine. It costs about $599 online and it earned 4 stars from more than 60 Amazon reviewers to make this one of the best duel fuel generators. Consumers like its power and feel it has perfect quality control. It runs at 3500 watts rated and 4400 watts starting. This Pulsar Duel Fuel PG 7500B Generator has a recoil starting system and an electric push start up to allow you to choose. It can be run by gas or propane depending on what you choose to use. It weighs about 184.5 pounds and it has a digital meter. It runs at 7500 watts surge and 6000 watts rated and 60hz. There are several outlets including one 120/240 volt twist lock, four 120 volts, and one 12 volt DC. It has a 13 hp 4 stroke single cylinder OHV air cooled engine for added power and it costs about $850 online. It received 4 stars from amazon reviewers. Consumers think it is built solid and is a good value. 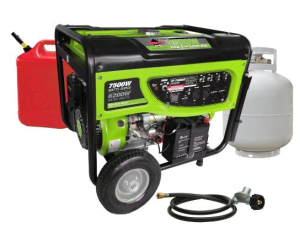 This Smarter Tools Propane Gas ST-GP 7500DEB Generator runs quietly at 72 dba and weighs about 128 pounds. It runs for nine hours at 50 percent load and has a fuel capacity of 6.6 gallons. On propane it runs at 6750 watts surge and 5580 watts continuous while on gas it runs on 6200 watts rated and 7500 watts surge. There are several outlets including on 12 volt 8a DC outlet, one 120 volt twist lock of 30 amps, and one 12 volt 17 ah battery. It has a convenient electrical starting system and costs about $800 online. It received 4.5 stars from amazon reviewers to make this one of the best duel fuel generators to buy. Consumers like how well it works and quiet it is. It has an easy assembly. See our updated Best Dual Generators For 2016 Review. 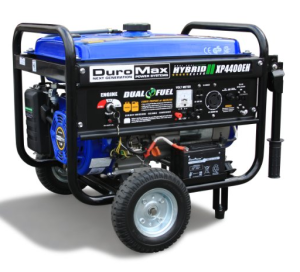 See our updated Best Dual Generators For 2015 Review. 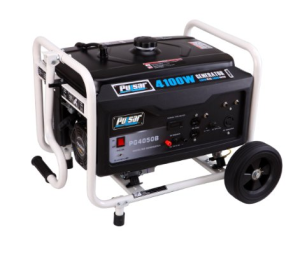 This Pulsar Duel Fuel PG4050 B Generator is compact in size and comes with various outlets including a 120 volt twist lock, one 12 volt DC, one 30 amp RV, and two 120 volt outlet. It has a recoil starting system and it has an OHV single cylinder 4 stroke engine for added power and it offers you the opportunity to switch from propane to gasoline as you choose. 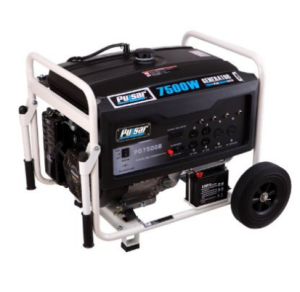 It runs at 3150 watts rated and 4050 watts surge at 60 hz and is a great small combo fuel generator for camping or powring the basics at home during a power outage. It costs about $530 online. All of these machines are ideal to have around your home when you are searching for the best duel fuel machines. They provide multiple capabilities that make them unique and easy to use when you need portable electric power most.